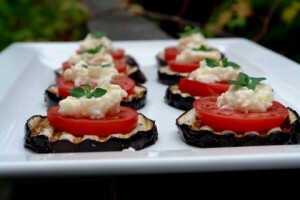 Eggplant stacked with tomato, basil, and a rich and creamy dollop of cheese. You’ll need a indoor grill for this recipe! Slice eggplant, toss with olive oil, and sprinkle with salt and pepper. Toss the eggplant on a preheated grill and cook for about 5 minutes on an electric grill. In a separate bowl, mix the grated cheese, garlic, mayonnaise and a dash of pepper. Arrange the grilled eggplant on a plate. Top each slice with a slice of tomato and a spoon of the cheese mixture and then garnish with a leaf or two of basil. Optional finishing touch: Drizzle with a little more olive oil, and sprinkle with a tad more salt and pepper. Serve with a basket of hot crusty bread! The eggplant can be served, hot or chilled!